The city itself should arguably be treated as a common: a collective physical and cultural creation by and for its inhabitants. However the range of activities permitted in urban spaces is becoming increasingly narrow. Many streets and squares are now managed by private owners and those held by the state are too often sanitised by public space designs that serve to enhance local property values and business rates. This leaves little possibility for the urban public to be used productively by its communities to sustain themselves materially or culturally. Where today is there space in public for people to work together to produce the city and its resources outside of market demands? Commoning, the collective ownership and management of resources, is currently being reimagined across social, political and economic debates as a response to this challenge facing all cities today. With Britain’s rich history of common rights, London is the perfect place to test commons out as a vital approach to urban design. I think London is a good place — though in many ways it is a difficult place as struggle of who has a right to public spaces is so very fierce here as the housing crisis grows ever bigger, austerity bites ever deeper and people’s lives become even more precarious. Once diversity of class and race and occupation is lost simply by virtue of who can afford to live in an area and who has been priced out, beautifying public spaces takes on a whole new dimension with its user-base fixed. The exhibition showed the ten winners, a few of them grappling in some way with these dynamics, though many not. It is a difficult thing to ensure manageable concrete interventions work to counter to the movements of capital and privatisation. In reality, I think that things like this can often contribute to such movements, many are easily co-opted into placemaking for the elite who can’t manage to create their own own bottom-up ‘culture’ the way it sometimes emerges naturally and vibrantly in cities, often in places where the local residents have had the time and inexpensive space to create. Holding an exhibition at LSE under the gazes of nobel laureate economists doesn’t give me more confidence, perhaps more so because I went there. Truth is, though, after having living in Glasgow, after visiting Liverpool and Sheffield, I find myself jealous of the kinds of shops and the activities (art, music, writing, all that stuff that almost never pays its own way) that can flourish there where ground rents don’t kill everything but boutiques and chain stores. Unquestionably, however, vibrant public spaces help people find the inspiration and the means of preserving their rights to remain living nearby. 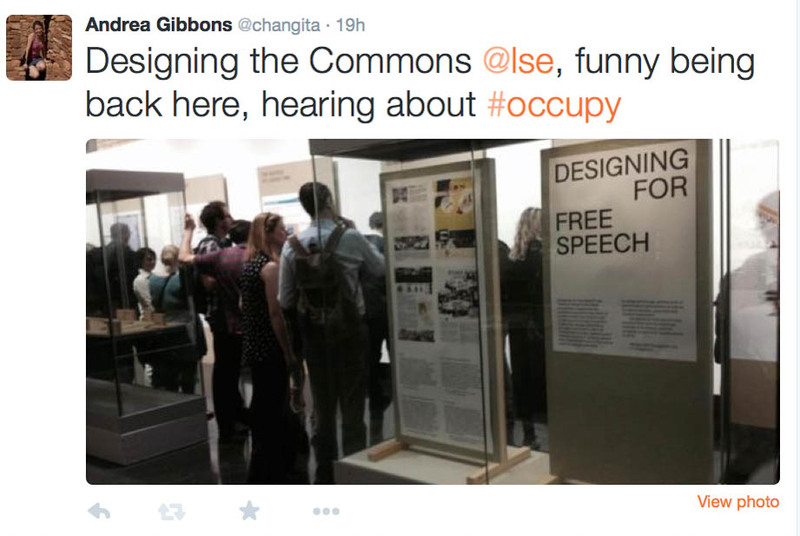 Such spaces also inspire people to fight for them, and protect them from privatisation. I quite love imagining how to help facilitate this vibrance, and thinking through just how much is possible through design. Whyte, Jacobs and Gehl among others show a great deal is possible. But only if you’re paying attention. One of the pieces — Service Wash — was certainly a provocation around austerity and its consequences (and while launderettes may be declining in popularity, I rather challenge its premise that they are no longer much used, as they certainly are in my neighbourhood, and I’ve heard that women come for miles to wash clothes with their mums on a Saturday, back to their communities where they can no longer afford to live). An urban phenomenon, the launderette is a relic of postwar social infrastructure, a provision intended to be egalitarian. Its decline in popularity is countered by an A1 class designation that prohibits change of use…thus explaining the bye-gone-era flavour of your local launderette. 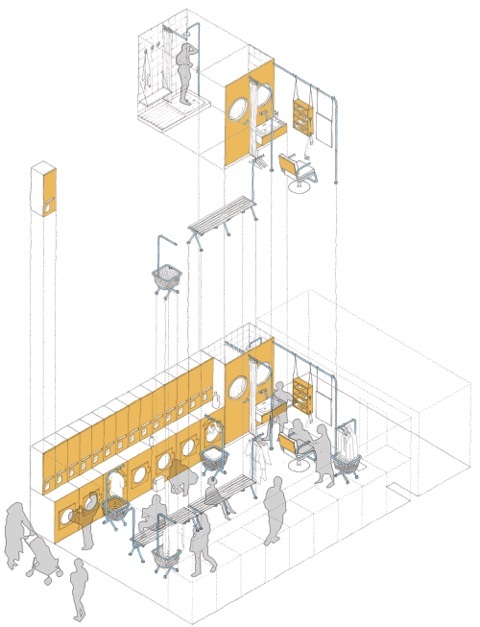 The Service Wash utilises the launderette’s quotidian presence proposing an expansion of its established function in favour of those most marginalised by urban renewal – the homeless. The physical inability to clean or be clean can be psychologically punishing; it creates an additional barrier to inclusiveness that the proposal aims to remedy. By partnering with homeless charities and drawing on existing initiatives, the launderette becomes a place to wash both clothes and self for those who have no other means to do so. It starts with a land trust…so I like it, though I’m not entirely sure I know exactly what it would be. It provokes questions about how commons are preserved exactly, and what happens when they are too full of activity and new building. I wonder. The winners were profiled on large boards along one wall, it was full enough to make it difficult to get wine and get close enough to the boards to read them properly, space was cleared though as the speeches started. Reinventing the Lodge is about creating a place to meet, a place to be and opportunities for things to do. To give people permission to inhabit this undervalued environment in new ways is to cultivate local pride, identity and sense of belonging – the feeling of being at home. Saturday Commoning Fever is an online platform that provides Londoners with means to common in the streets of the city. By simplifying “street rules” in a website rather than hiding in regulation files, we aim to question those rules and challenge them. 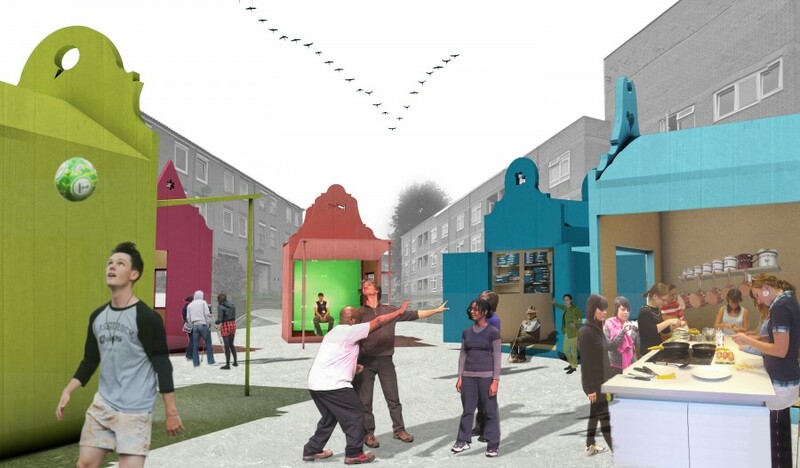 “Rainbow of desires” is a set of small pavilions installed in the open spaces of the Rhodes estate in Dalston. During a period of three months the pavilions are doubling as performative devices and workshop spaces based on the techniques of the theatre of the Oppressed and spaces of communal everyday life (public seating area, an open kitchen, an exchange library, a cinema). A good event, it was wonderful to view the ideas that poured out in response to the call and honestly, can we just put up these notice boards around lamp posts already?